Hand hewn stone provided the first curbs and cobblestones of early American cities. Many arrived as ships ballast and were used in the colonial ports. These stones had long been the standard in Europe until the economy of concrete pavers replaced them for street paving. Yet the beauty of granite remains where the old stone pavers were moved to public spaces, squares and plazas. There they be laid in exactly the same way as any precast paver, but the result is not only longer lasting, it is a truly timeless look. Natural stone used for paving is very strong and dense, suitable for both pedestrian and vehicular traffic. 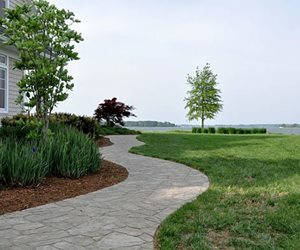 For this reason, the usual paver on a sand bed installation detail uses a stone unit that is just 1 1/4" thick compared to clay or concrete manufactured pavers are at minimum 2 1/2" thick. But due to the variability of natural stone, it can be quarried in units up to four inches thick. Stone is cut from the quarry and hand finished into very precise units. These can be treated different ways to produce a wide range of finishes. They may be tumbled, antiqued, chiseled, sandblasted, flamed, honed and polished for a mirror finished or a battered old world look. Stone pavers are made in a wide range of sizes. Larger slabs are growing in popularity for porous paving, particularly where a uniform appearance is desired as is the case with modern architecture. The weight and strength of these units that are virtually unlimited in size provide a wide range of options for the designer. 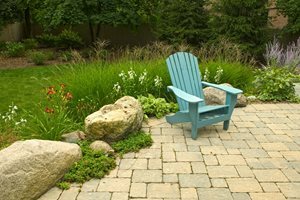 There's no question, using a natural stone paver will cost more than a concrete paver. 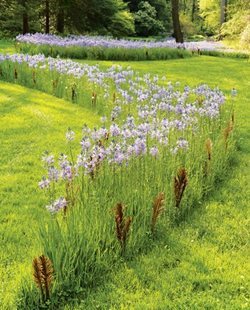 "Here in Maryland we've had a change in the way landscapes are installed. 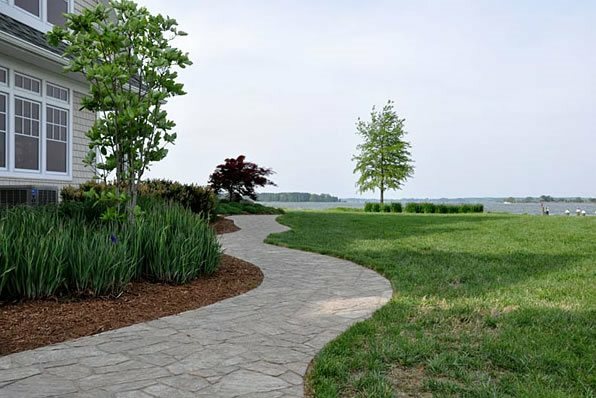 The landscape contractor has taken on concrete unit paver patios and walkways. But when our customers use natural stone, they need a skilled stone mason to give it the finished look they want. So you have higher materials cost and the increased labor of stone masons," says Cedric Pittman of The Stone Store and Stone Scapes Design in Maryland. "But some customers are willing to pay for the look they want at any price. Stone is always a good investment because it holds its value over time." Learn more about paver cost. Natural stone can be quarried in an endless array of sizes since there are no truly standard dimensions. However, because this is a quarried and cut stone, it is possible to obtain pavers of any shape, but more complex cuts may increase the already high costs. Units are typically square or rectangle unlike manufactured concrete pavers that may feature hexagonal shapes. When used in patterns, it's typical to lay either a three-stone pattern or a four stone pattern with a wide range of color variations. These are large hand hewn granite units that range from 3 to 4 inches thick and vary in length. They are reproductions of the old ballast pavers from Europe that are a popular choice for curbs and edges of stone and concrete paver driveways and patios. Paver stone may be quarried locally or imported from other states and even from overseas. Cedric Pittman from The Stone Store in Hanover, Maryland finds a strong demand for locally quarried material. "We use a great deal of Pennsylvania bluestone due to its availability. It's also been used for a long time in this area and our customers are familiar with its look. It's very hard and durable, and the suppliers are even sending it out west." While you'd think that stone quarried abroad would be more expensive, that's not always the case. "Lately there's been an influx of sandstones and quartzite from Indian China which offer a huge range of new colors. Price wise, this is sometimes cheaper than locally quarried stone, probably due to differences in labor and raw material costs. Just a few years ago all our stone was in the grey and brown tones, but now we offer reds and golds with quartzite silvers all at competitive prices." Granite has long been used for street cobbles and public spaces do to its durability and longevity. It is renowned for resistance to extreme weathering and cold. Limestone is the hardest of all sedimentary stones and is popular for the unique patina created by traces of fossils. It is not as weather resistant however, and for outdoor use sealing at installation and regular reapplication will be vital to maintaining its beauty and longevity. Limestone is typically available in gray and beige. Marble is actually derived from limestone changed by pressure and heat. The swirls that make marble so beautiful are the layers and impurities within them distorted by pressures. This provides a wide range of colors from pure white to earth tones and blues. 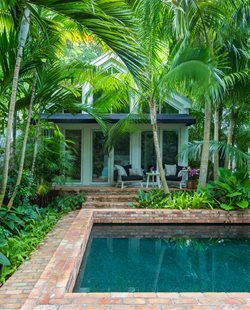 This is one of the most colorful stone choices and its surfce resists heating in the summer time so it has long been used around pools and for patios and walkways. It is also a naturally non-slip material. 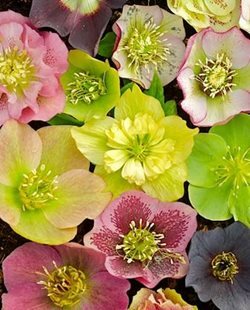 The wide range of colors include apricot, yellow, reds, dark greys and silver. Real stone allows the greatest range of finishes that lend a variety of surface characteristics that can be very elegant to truly rustic. This is one of the most desirable aspects of stone, for the same material may be used on different parts of a landscape by merely changing the finish. Where architectural styles may copy those of older European or Mediterranean styles, stone can be treated to visually match the look of ancient or reclaimed building materials. 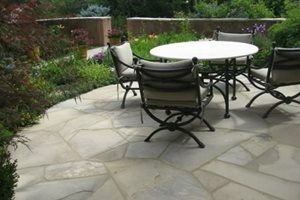 This is the outdoor alternative to a polished stone patio because it is far less slippery. The result is a smooth satin finish that is not shiny but still very elegant. This finish is ideal where interior polished stone meets exterior stone pavers at the threshold to minimize visual change. A diamond blade is necessary to create a crisp, saw-cut edge. This surface is more slip resistant than a honed one, but there may be some saw marks visible on the surface so it appears slightly less refined. 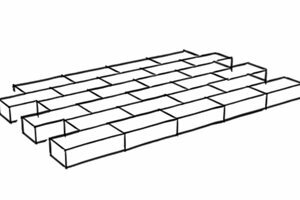 This method applies flame and heat to the surface of a stone paver to force pieces to detach like scales for a more durable, non-slip finish. This process tumbles the stone paver to give it a less geometric look. Each unit may exhibit chips, splinters or slight fractures. This method rolls newly cut stone pavers in a drum to create a well used patina and texture. It is popular for homes where the stone work must look as though it is very old and is ideal for classical architecture. When designers want the stone to look as though it was reclaimed from old buildings, much like popular used brick, it begins with a chiseled edge, then is sandblasted and finally acid washed. This is yet another method for making a smooth paver look old and well used. It is the logical next step to a chiseled edge paver. The large deep chips are the most effective to creating the hand-hewn look.